The California Department of Technology (CalTech), formerly known as the California Technology Agency (CTA), is responsible for the approval and oversight of all state information technology projects. Its 1,200 employees oversee information technology projects and public safety emergency communication systems, as well as establish and enforce statewide information technology policies, standards and strategic plans. The agency has been at center of a major reorganization and consolidation, begun in earnest during the Schwarzenegger administration, of information technology resources and projects across state government. The agency transitioned from independent status to operating under the new Government Operations Agency as part of a larger government reorganization on July 1, 2013. California state government has a long, storied history of information technology failures, but the granddaddy of them all was the Oracle debacle at the turn of the millennium. The California Department of Information Technology (DOIT) was created in 1995 to oversee planning development of government information technology and was instrumental in securing a six-year, $95 million contract with Oracle for enterprise software. The no-bid, sole-source deal was widely scorned and triggered an investigation by the State Auditor in 2002, who issued a scathing report that alleged, among other things, that the state might have saved $41 million if it had obtained the software without the contract. The Legislature held two months of hearings, four state officials resigned (including the department head), the state cancelled the contract and then it shut down the department in 2002 and scattered its remains throughout the government. Four years later, a new law established the Office of the State Information Officer and charged it with coordinating government information technology efforts. In 2007, the office's duties were expanded to include planning and project approval. Governor Arnold Schwarzenegger's IT Reorganization Plan in 2009 further consolidated statewide technology functions under the office and the next year he signed an executive order requiring information security officers within state government offices. The plan, eventually codified in AB 2408, combined the Office of the State CIO, the Office of Information Security, the Department of Technology Services, and the Department of General Services’ Telecommunications Division. 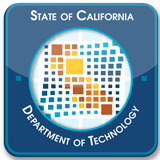 On September 28, 2010, the governor signed legislation renaming the office as the California Technology Agency and extended its sunset provision to 2015. In September 2011, newly-appointed agency Secretary Carlos Ramos announced a reorganization that separated service delivery from control functions such as policy and oversight. The following year, under a government reorganization plan proposed by Governor Jerry Brown, the agency began a transition from independent status to a spot in the new Government Services Agency. The transition includes a name change, to the Department of Technology, and removes the director from the governor’s cabinet, although he will maintain a direct report to the governor on information technology issues. The Department of Technology’s responsibilities include: IT project oversight, engineering and technical support services for public safety-related communications systems, managing enterprise information technology, IT procurement policy, data center service and oversight of the 911 network and 500 police, fire and paramedic dispatch centers. A month later, Ramos announced a significant internal reorganization of the agency, dividing operations into basically two distinct sections. Each section is run by a deputy director. The control section of the department consists of policymaking, oversight and various administration functions. The Office of Technology Services (formerly the Department of Technology Services). Otech serves as the state's data center, delivering computing, networking and electronic messages to state, federal and local government entities. The Public Safety Communications Office. The division designs, engineers and installs the state's radio and microwave systems while providing equipment maintenance and repair. The office also provides oversight of the emergency 911 network and 500 police, fire and paramedic dispatch centers around the state. Geospacial Information Systems. GIS integrates hardware, software and data capturing, managing, analyzing and displaying geographically referenced information. The agency also operates the Office of Information Security, the state's primary government authority ensuring the protection of state systems and applications. It is the liaison to state, federal and local government entities, as well as higher education and private industry on security matters. It maintains a link to the Cyber Operations Center Dashboard, a resource that provides real-time data regarding the international cyber security environment. CTA’s web services section hosts the government’s primary data website, which makes more than 100,000 records available to the public and provides the raw material for the collaborative data sharing effort Apps for Californians. The agency also hosts the Transparency in Government website, which makes available to the public information on contracts, state audits, expense claim forms, travel expenses and Statements of Economic Interest (Form 700). The Department of Technology has an annual budget of less than half a million dollars, but its influence is felt throughout the state’s entire information technology network. It participates in planning, development, management and procurement procedures of more than 70 IT projects with a total cost of $7.8 billion. The agency officially began a major reorganization of state IT services in 2009, but could easily be said to have started the process in 2002. Its 2011-12 budget showed an increase of $19.7 million and 23 positions for its expanding data center and support for its migration of state agencies to a shared email system. As part of the reorganization, the agency has a number of consolidation goals. It claims $75 million in data center savings since 2006-07 and a 37% reduction in IT-related energy use since 2009. The problem wasn't so much a failure on the part of the agency as it was an acknowledgement of the task at hand. As of May 2011, the state had 70 IT projects under construction with a total cost of $7.8 billion and the agency was using relatively new project management methodologies to keep track of it all. The high cost and the lack of a track record on projects that will take a while to complete left the auditor uneasy about the risk at hand. The auditor also noted that despite progress in IT governance and oversight, “the State continues to experience issues such as increasing costs and slipping timelines.” The report singled out four large projects that by themselves cost $4.4 billion and were a particular cause for nervousness, although it pointed out that only two of the projects were directly under the agency's purview. FI$CAL, the Financial Information System for California, and the 21st Century Project, a statewide personnel system, both were undergoing significant challenges. The agency has oversight over both, although the auditor did not direct any blame its way. The agency monitors but does not oversee the Corrections and Rehabilitation Department's Strategic Offender Management System, which is struggling while under court-ordered supervision of the federal government. The auditor concluded by outlining the disastrous situation facing the judicial branch's Court Case Management System that started out with a price tag of $260 million but is projected to hit $2 billion when, or if, it is ever completed. The agency has no oversight of the project…yet. “I believe California’s CIO presented an unbalanced, and perhaps even misleading, view of success and likely failure on the state’s IT project portfolio,” responded Michael Krigsman at ZDNet. He accused Takai of selectively pulling project examples of relatively short durations that conveyed “precious little” about overall IT capacity to deliver on time and within budget. Krigsman questioned why the list of 10 completed projects contained only two with costs above $1 billion and none of any duration beyond two years. A list he gleaned from the data of large active projects had a mean project cost 10 times that of the “successful” projects and a projected completion time three times as large. Evans blogged his criticism in January 2009 when the state was looking at a $40 billion deficit, yet was planning nine projects costing $3.6 billion. He questioned Takai’s honesty but applauded her courage. Days after Krigsman published his criticism, blogger Jon Ortiz at the Sacramento Bee asked Takai’s right-hand man, Chief Deputy Director Adrian Farley, to respond. Farley admitted that the strategic plan contained “unclear language” and “nomenclature” in publishing the length of a project, a key factor in determining its success. Krigsman took back his accusation that Takai “deliberately intended to mislead the public” but still took issue with the agency. “Large IT projects combine substantial cost with high complexity, creating tremendous risk and corresponding opportunities for waste. Government agencies have an obligation to report this data clearly and accurately,” he wrote. Although information technology in California state government has undergone a vast reorganization, much more has been proposed. In 2008, the Little Hoover Commission recommended that management of the FI$CAL and 21st Century projects be transferred to the agency. They weren’t. It unsuccessfully argued that the agency head should be appointed to a 5-year term rather than serve at the governor’s pleasure. And it recommended that the state consolidate the IT workforce under the agency, but the state chose to maintain a “federated” model through agencies and departments. During an appearance at the 7th Annual California State Technology Executive Seminar in September 2011, Secretary Carlos Ramos was asked about the troubled $1.8 billion Court Case Management System (CCMS) that has been likened by the state auditor to the 2002 Oracle debacle that toppled the CTA's predecessor. Although CCMS is run by the Judiciary Council and its administrative office, and lies totally outside the purview of Ramos' agency, he more than implied that CTA might be extending its reach in the near future. Ramos told the audience that his agency “would have to get involved” with CCMS, which could set up a potential constitutional confrontation between the executive and judicial branches of government. The judiciary computer system has been an object of scorn since its inception. Originally priced at $260 million, estimates now range as high as $2 billion and it may never be finished. It might be a classic example of what happens when technological oversight of projects is spread across government rather than concentrated in a single agency. California government is only now coming to grips with the issue of how best to leverage technological expertise. The past 20 years have been replete with ill conceived, poorly coordinated technology projects run by various tech departments scattered all over government. After numerous fits and starts, and disastrous setbacks (like Oracle), California's executive branch may be on the right track with its newly-reconstituted Technology Agency. But wide swaths of government, funded by taxpayer dollars, are still going their own way with damaging consequences. CalPERS, the state pension system, is also late and over budget but lies outside CTA's purview. The agency only tangentially monitors the troubled Corrections and Rehabilitation Department's Strategic Offender Management System. Independent watchdogs like the Little Hoover Commission, the Legislative Analyst's Office and the State Auditor have argued for years that consolidation of technology efforts would save money, produce better results and greatly reduce the chance of catastrophic failure. Some barriers have already been removed, to the state's benefit. Others barriers remain. One attempt by the Legislature to strengthen CTA oversight of the judicial computer system failed to make it into the final bill. Secretary Ramos told the Little Hoover Commission in August 2011 testimony that he would be amenable to having his agency granted more authority over non-executive branch IT projects, including the courts, the Corrections department, constitutional offices and independent agencies. Not everyone appreciates a monolith. There is something to be said for individual agencies, especially large ones with compelling resources, having direct control of their information technology to make sure it is responsive to their needs. That diversity was partially recognized when the state chose to keep the IT workforce “federated” through agencies and departments rather than consolidated in one workforce within the CTA. Resistance to consolidation efforts has come from diverse quarters. IT industry associations, individual vendors and department CIOs expressed concerns that included data center consolidation and migration to one of two new state email systems. One state agency commissioned its own study comparing the agency’s federated data center to a private sector-hosted model and reportedly found the former financially inferior. Lurking beneath the surface of any large reorganization is the suspicion that the true motivation is simply to reduce services and personnel to save a buck. Considering California’s repeated multi-billion-dollar budget shortfalls, that suspicion is not necessarily misplaced. After years of stumbling through one failed technology project after another, abandoning one organizational structure after another and shuffling the personnel boxes on the organizational chart, it remains to be seen if California is up to the challenge. Teresa “Teri” Takai, 2008-2010. Takai left California after being nominated in August 2010 by President Barack Obama to be chief information officer at the Department of Defense, an assistant undersecretary position. When the Senate failed to take up her nomination, Defense Secretary Robert Gates appointed her to the post in October but had to discard the assistant secretary title to do so. J. Clark Kelso, 2002-2008. Kelso is a professor of law and senior counsel to the Capital Center for Government Law and Policy at the University of the Pacific's McGeorge School of Law, where he has been a member of the faculty since 1986. He is also a longtime Sacramento troubleshooter. Kelso replaced state Insurance Commissioner Chuck Quackenbush when the commissioner resigned in 2000 amid allegations of corruption. He was appointed California chief information officer in 2002 after a $95 million scandal involving Oracle led to a major reorganization of the state’s IT. In 2008, Kelso was made federal receiver in charge of medical care within California’s prison system where his job was to raise the level of care to meet constitutional levels ordered by the District Court in San Francisco. Returning to state government after three years as an independent consultant, Carlos Ramos of Elk Grove was named secretary of the cabinet level agency in June 2011 by Governor Jerry Brown. Ramos was principal budget analyst for the state Department of Finance from 1989-1997, branch chief for the child welfare services case management system for the Department of Social Services from 1997-1999 and deputy director and CIO for the Department of Social Services, 1999-2001. In 2001, he moved to the Stephen P. Teale Data Center, one of the state's two general purpose data centers, where he was director until 2004. Ramos, a Democrat, was the senior technology executive of the state Health and Human Services Agency from 2004-2008, where he had IT portfolio oversight of 14 departments. During his last two years at the agency, he directed the newly created Office of System Integration that manages the agency's multibillion dollar IT portfolio. Ramos left public service in 2008 to start Maestro Consulting, an IT consulting business. He is a senior fellow for the Center for Digital Government, a member of the Human Services Information Technology Advisory Group, and a member-at-large of TechAmerica. In his new post, Ramos plays a key role in dealing with troubled state technology programs already receiving public scrutiny. The state's struggling financial information system, FI$CAL, is expected to cost $1.6 billion and the judicial system is enmeshed in controversy over its case management system that is behind schedule and way over budget.